My love a trains started at a young age. When I was a child we would go to Stroudsburg, Pennsylvania to visit my great grandparents, on my mothers side of the family, at their apartment on main street. In the dimly lit back room my great grandfather had a HO train platform with two lines, buildings, people and old Matchbox cars set up on it. Not only did he have a HO train platform, but he actually worked for the New York, Susquehanna & Western Railroad. He wasn’t my only relative to work for the railroad. 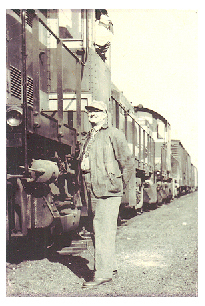 My great grandfather, great uncle and uncle, on my fathers side, worked for the Pennsylvania Railroad in Harrisburg, Pennsylvania and on my mother’s side of the family I had several great uncles who worked for the Lackawanna Railroad. I still had plenty of memories of the railroad from the Harrisburg area. My grandparents lived in West Fairview, Pennsylvania right next to the Enola Rail Yard. I remember running outside when ever I would hear the rumble of the diesel locomotive and the squeals and clacks of the freight cars as they would enter and leave the yard. What a sight for a young kid to see, the yard filled with freight cars and locomotives. When we would get home I’d get out the paper and crayons and draw my version of trains. When I was 6 years old my parents bought me my first Lionel train set, a Lionel Trains-N-Truckin set with a Republic Steel Switcher, that I would set up on the floor in the living room. To this day I still have some of the pieces to the set. A few years later for Christmas they got me a Lionel Illinois Central #8030 GP-9 Locomotive, which I still run regularly on my train setup. Over the years growing up my parents would get me a Lionel train car for the holidays to add to my small but cherished collection. After having the same locomotive for nearly 25 years my wife got me a Lionel Pennsylvania Flyer set with a steam locomotive for Christmas. To this day I still am adding new trains to my collection and enjoying them with my family. As I grew up I never seemed to out grow my love of trains, there always seemed to be some sort of railroad reminder where ever I was. 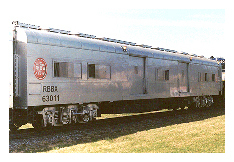 Right in front of the window I sat at, at my first job, was the short line operated by the North Shore Railroad. I remember sitting there and watching as the locomotive and 5 to 6 freight cars would pass buy on their way to local business. What a sight to see. Later at another one of my jobs there was again a short line running in front of the building, this time it was operated by the Nittany and Bald Eagle Railroad. I remember it was always a big deal when the Ringling Bros. and Barnum & Baily Circus would come to town, as every one was anticipating the arrival of the train with the circus cars. I live in Berwick, Pennsylvania now and my drive to work takes me along the short line operated by the North Shore Railroad and on any given day you can see the SW1500 locomotive pulling freight cars to local business. And the best part is that it passes right thru my mother-in-laws back yard. Now when we are there visiting and we hear the train, the kids and I run outside to wave at the engineer. It reminds me of when I was a kid at my grandparents. Now this isn’t the only railroad to run in the Berwick area. Across the river you will find a Canadian Pacific line, so you never know when you will spot a train running thru the area. Now 30 years later I still have that same fascination and excitement about trains as I had as a kid, but now I can share it with my wife and 3 daughters, weather it is watching a real working freight train pass by, taking train excursions at tourist railroads, or running my O and HO gauge trains. With my love of trains and photography i decieded to create the Berwick RailFan Photo Gallery in 2009 and have since joined the Loose Ties Model Rail Road Club and volunteer at the Wheelchair Enginners Model Railroad Program. All photographs and art are the property of Andrew Hoke/Berwick Railfan (2009-2011) and can not be used in any way without permission. If you would like to use any of the photographs on the Berwick Railfan Photo Gallery website, or have comments and questions please EMAIL me. Please give a photo credit and a link to the Berwick Railfan Photo Gallery for any photos used either on the internet or in print.